My life dramatically changed after almost three months of being sugar free. Except for a glowing skin, I didn’t notice much of a difference while I was off any kind of processed sugars, but it’s what happened next that got my attention. Not only did I not crave any sweets, but my sensitivity to any type of food with processed sugars increased to such an extent that it almost became a sort of a nuisance. I can’t even eat a small piece of the best Belgian chocolate without being overwhelmed with a sensation of heaviness, of over-exceeding sweetness. It’s the same feeling I got when I used to eat half a pan of brownies, go figure. Don’t get me wrong: I’m not complaining. I just… I’m amazed. You see, that doesn’t happen if one stops eating apples for three months. You don’t eat a first apple after two months and just go bleah. It’s a sad truth for the baker in me, for the pastry chef in me that is screaming on the inside, craving to make Pavlovas or macarons or fancy seven-layer cakes. But if that has to go for my body to be happier and healthier, so be it. 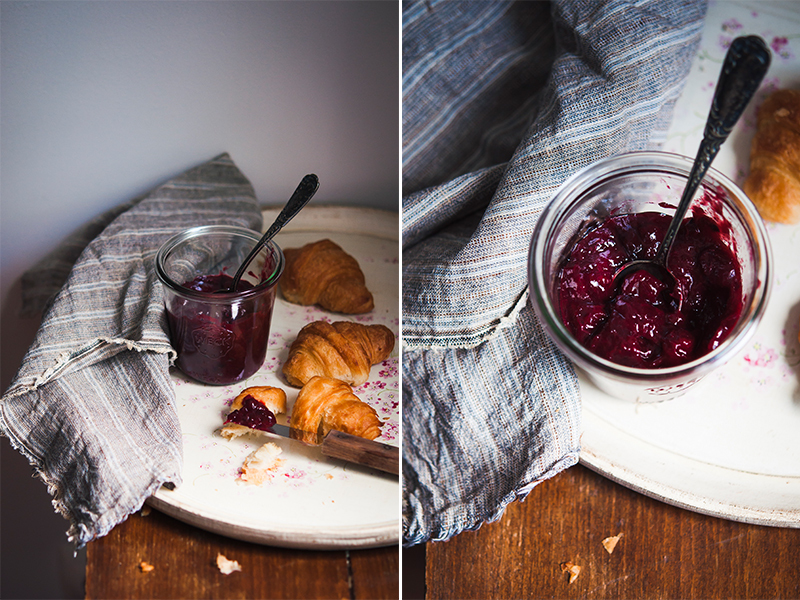 In my panoply of sugar-free recipes, this plum jam reigns supreme. It’s been in my family since forever and it has now become my favourite ultimate morning delight. I like to spread it on a slice of soft-buttered sourdough bread or some (guilty!) 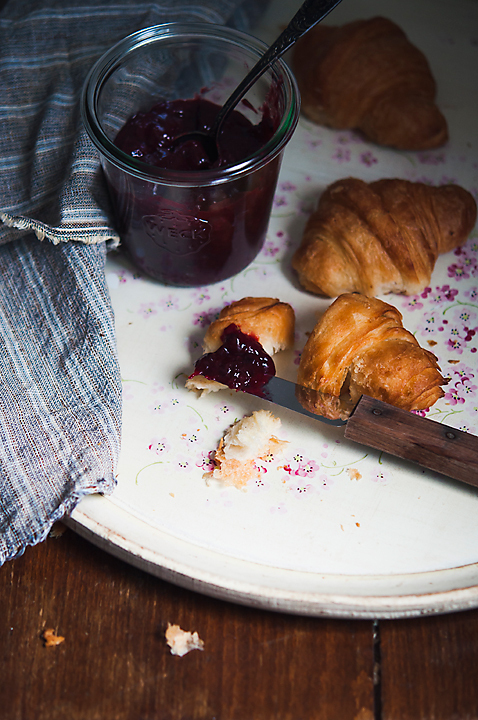 viennoiserie and eat it like it’s nobody’s business. It’s hard not to – it has a very specific sweet-tart taste, perfectly balanced so that it doesn’t gross anyone out. The method is quite simple, but it does take some patience to make. One has to find the sweetest, softest, ripest plums, core them, slice them in large chunks, put them in a heavy-bottomed pot and simply simmer them on a medium flame into the thickest jam. At the beginning, there’s not much stirring involved: the plums will start to soften and release their juices and it will all smell and feel fantastic. After a while, the liquid will start to evaporate and the jam will start to thicken: that’s when it needs your undivided attention and stirring. In the final stages, you’ll see that you have to stir almost all the time or otherwise it’ll stick to the bottom of your pan. If it has drastically changed in colour and has become really thick, that’s when you know it’s done. The time to make this jam varies according to the amount of plums used: the less plums, the shorter the time – the more plums, the longer the wait. For instance, for 3 pounds of plums you might wait for an hour or so, but you’ll only get a tiny jar of jam, maybe a family’s serving for a day. For 15 pounds you might wait as much as four hours, but it will be worth it. What you do need to know is that, at the end of this entire process, you’ll be left off with a much smaller batch than what you started with, even less than a half. I like to mix the jam with walnuts and maybe add a crushed aspirin if I plan to keep it for longer periods in the pantry: it helps with the preservation. The jam goes, without saying, into sterilised jars and will keep for very long years if stored properly in a dark, cool place. I just made one batch today and the taste and smell were amazing, I ate one jar all by myself, without feeling any guilt at all :) Life’s good when you’re off the processed sugars roller coaster! Sorry to comment on something that’s months old but I found this whilst looking for a sugar free plum jam recipe. The wild plums near me (2 varieties, red ones and gold “mirabelle” ones) are just coming in now and there are masses of them. Not enough people eat them and there’s too much for wildlife, so I thought I’d give jam making a go. Am I reading this right? You just chop and cook them until they turn into jam? No apple juice or anything else? I also thought that, being a wild variety, they may turn out a little too tart. Would you add an artificial sweetener, or can you suggest a good natural substitute? Hei Jo, it’s never old if it’s plum season! 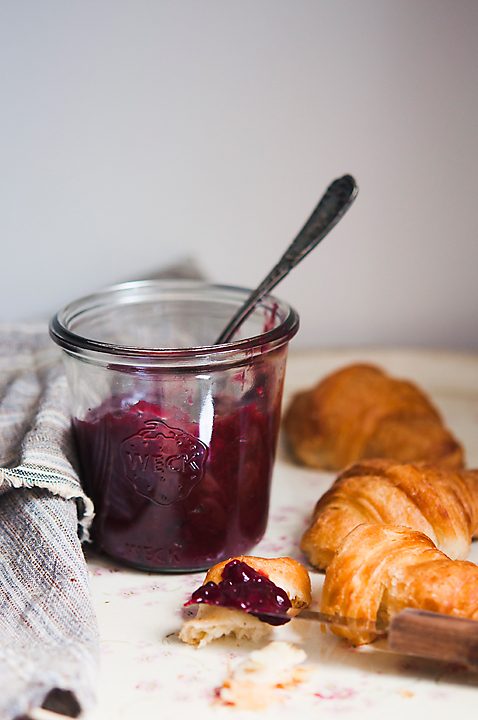 :) Yes, you’re reading it right: this plum jam is made of nothing but chopped plums cooked to perfection, no other additives needed. The variety we use in Eastern Europe is perfect for this, I’m not sure about other types of plums, but I guess the only secret to it is to have really, really, really ripe plums, they should be soft to the touch and full of juice. If I were you, I’d give it a go using red plums and start off with a small batch because it’ll get cooked faster and you won’t waste too much produce if it doesn’t work out. If you do try it, please leave me a message and tell me about the results, it would be interesting to know if this recipe works for other varieties as well! Good luck! I’ve never heard of using crushed aspirin to preserve jam! can you say a bit more about it? I try to avoid pain relievers for so what would be a natural alternative? Hi Am. I know my answer comes very-very late (so sorry for that, I was on a long blog-break) but yes, we use crushed aspirin to preserve jam here in Romania, we’ve been doing that for basically… ages :) Because this jam has no sugar, aspirin prevents it from going rotten but if you’d rather avoid pain relievers than just skip it and make sure to keep the jars in a cool, dark place. It also helps if you eat them within the year, they won’t keep for that much without the aspirin. It doesn’t bother me to use aspirin to preserve the integrity of my jam batch, it’s in a very small amount. I have several pounds of Italian prune plums. I’m thrilled to try making jam without sugar as the plums are already so sweet. What do you think about putting the plums in a crock pot slow cooker overnight? Would they be too cooked? Thanks! Hi Melissa. Sorry for the veeeeery late reply, as I said above, I was on a very long blog-break. I don’t know about the slow cooker, to be honest I’ve never used it for jams so I don’t know what to say, except that the only thing that could go wrong is that the jam would get real thick. By the way, have you tried that? If you did, I’d love to hear how that went. Hi Sarah! I usually put them in the dishwasher (no detergent) and give them a nice, hot bath (60-70 C/140-160 F), then use them immediately for the jam. I love that the dishwasher sterilises the jars at high temps and then it also dries them. Alternatively, I put them in a tray in the warm oven (usually the lowest temp) and keep them there for about 15-20 minutes, till they become warm (making sure they don’t crack because of the heat though). My mom usually pours the thick hot jam in the jars the moment she makes it but doesn’t put the lid on until the next day – she says that’s the secret :)) Can’t fight tradition! Great recipe! We used 1/2 of the juice of lemon in lieu of the aspirin. Tastes great- sweet and tart! Thanks for the great recipe! Hi Andie, I am so happy you put your story and recipe online. I tried it and love it. What I did was put a wire rack under the pot and simmered on low for a few hours. My husband finds it a bit tart so I added a tiny amount of sugar but it is so much better than making it with pectin. They call or 7 1/2 cups sugar to 4 1/2 cups plums. I couldn’t imagine making jam with more sugar than fruit. I love your method. I have a tree-full of Italian prune plums right now (near Rome!) and am looking at your recipe. It says in sterilized jars the jam can keep for years, but then says to eat it within the year if not using aspirin, did I understand that correctly? How long will it keep in the fridge once you open a jar? Thank you! I agree, it is a shame to add sugar to already-sweet fruit! I like to taste the fruit! Hei Joanne, you got it right: it can keep for years if stored in sterilised jars with aspirin, but if not using some form of preservative than it’s a bit of a lottery. It happened to me one year that I didn’t use aspirin and had minor problems with some of the jars, that’s why I felt like adding this advice, you know, just to be absolutely sure. If you open a jar and keep it in the fridge, it can last for a couple of weeks or so. But you know what the fun part is? Even if I see that fungus (mildew) forms on top, I just remove it with a spoon and continue eating the rest of the jam no problem. I don’t recommend it so please, please take it with a grain of salt, but I’m just saying that we’ve been doing that for generations no problem. Hi there, this is a really late addition. Your next-door neighbours (in Hungary) traditionally made their plum jam in the wood-fired oven in large earthenware jars, until it was rock hard. No sugar, no preservatives (although as my doctor prescribes me aspirin anyhow I’m tempted to try out your recipe!). They covered it with a cloth, tied with string. It lasted forever – my Hungarian wife’s grandma’s jam was still perfectly edible years after she had died. But nobody I have met in Hungary – and I’ve been living here many years – has ever heard of putting walnuts in their plum jam, which I do, as I think it vastly improves the flavour (if you like walnut, of course). Not only that, but the walnut flavour permeates with time, so the jam actually improves with age! This sounds amazing. I’m thinking I would still water bath can them, just to make sure they seal well. I guess that’s the food safety instructor in me. Thanks for all of the info on this. It sounds amazing! Hi Colin, I use one or maybe two aspirins per batch, depending on the size. I just add it in the pot after it cools down a bit and then the jam goes into the jars. Hi Andie, I am big fan of plum jam and am following your recipe and being a big fan and user of ASA I want to add it to the mix. How much of aspirin would I need for each pound or kilo of finished jam? Hi Jonathan, I’d say around one aspirin per 2 kilos of finished jam.